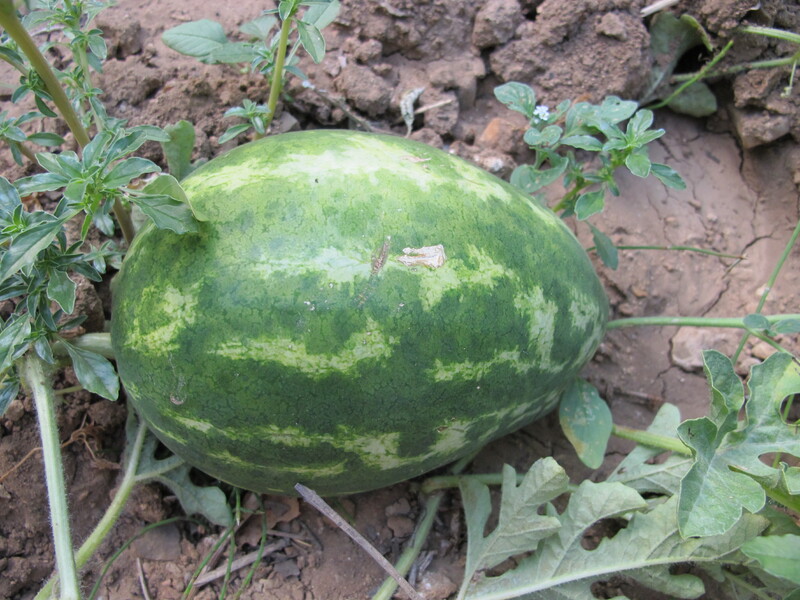 …a watermelon in the huerta. Oddly, they need hardly any water. Not like melons which need lots. August 17, 2013. 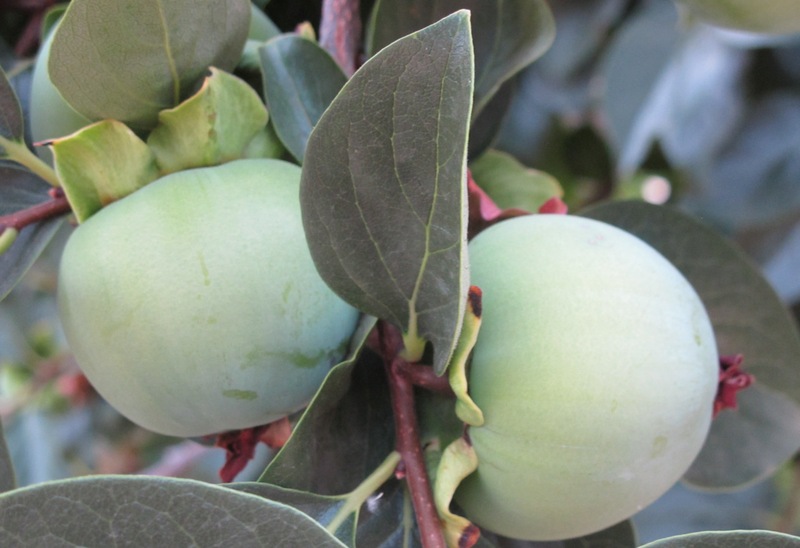 This entry was posted in Garden and tagged Andalucia, fruit, garden, living abroad, Sandra Danby, Spain, travel on January 29, 2016 by sandradan1. 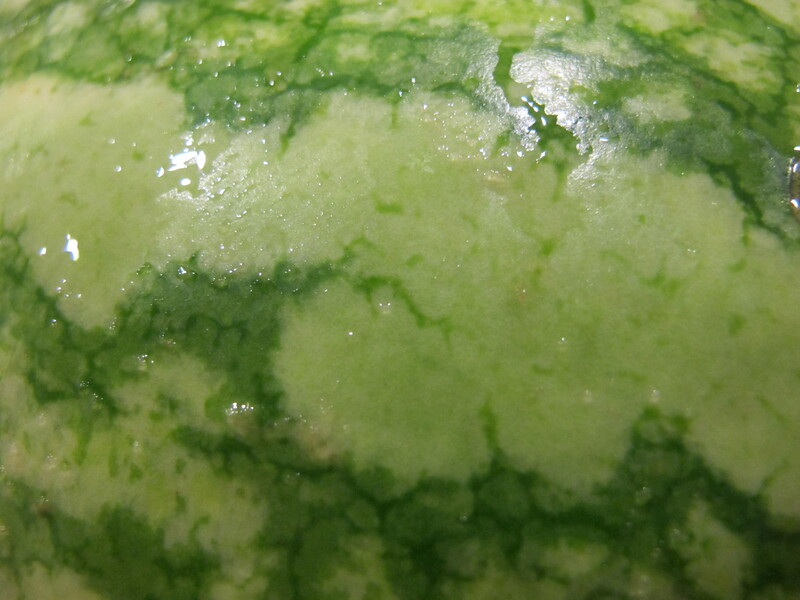 This entry was posted in Fifty Shades of Green and tagged Andalucia, food, fruit, living abroad, photography, Sandra Danby, Spain, travel on November 25, 2014 by sandradan1. Its odd how often baby fruit grow in clusters of pairs, snuggled up together, cosy and safe. 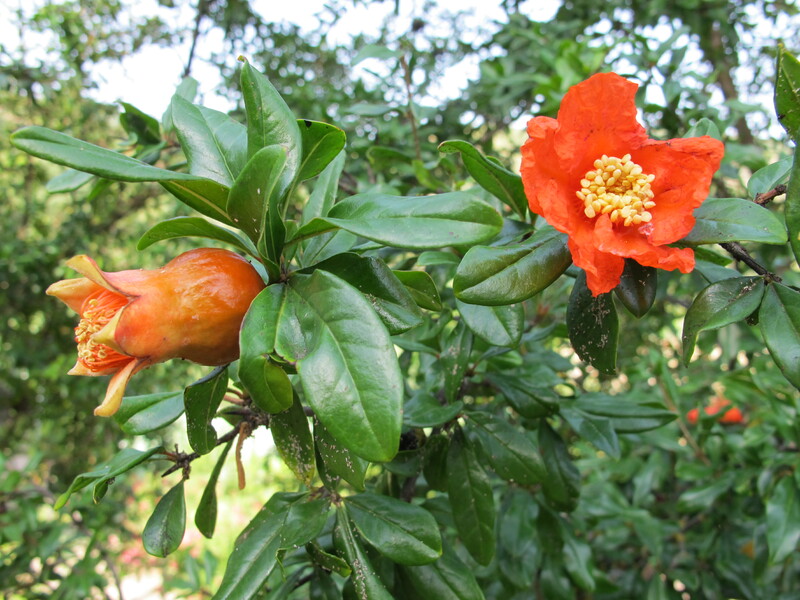 Pomegranates, persimmon … even vegetables get in on the act. Nature’s way of pairing us up, I guess. 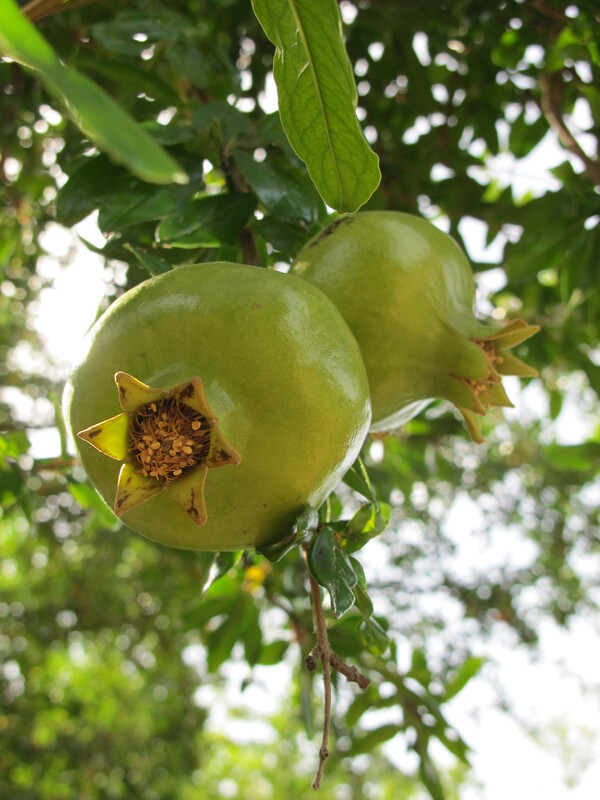 Pomegranates in August, getting bigger but still green and still together. I look at these photos and hear Ella Fitzgerald’s singing ‘Let’s Do It’ and it makes me smile! Part of the pleasure of this Challenge is visiting new blogs which other bloggers have recommended. These are my two featured blog links this month, so please visit and enjoy! Jessica’s gardening notes at http://brownpaperbelle.com/ are fascinating as she’s in Queensland, Australia and so in a hemisphere/season so different from ours. Her website is beautiful to look at, and the recipes are good too. I also love the recipes at http://homemadewithmess.wordpress.com/. Check out the strawberry vanilla and coconut crumble! 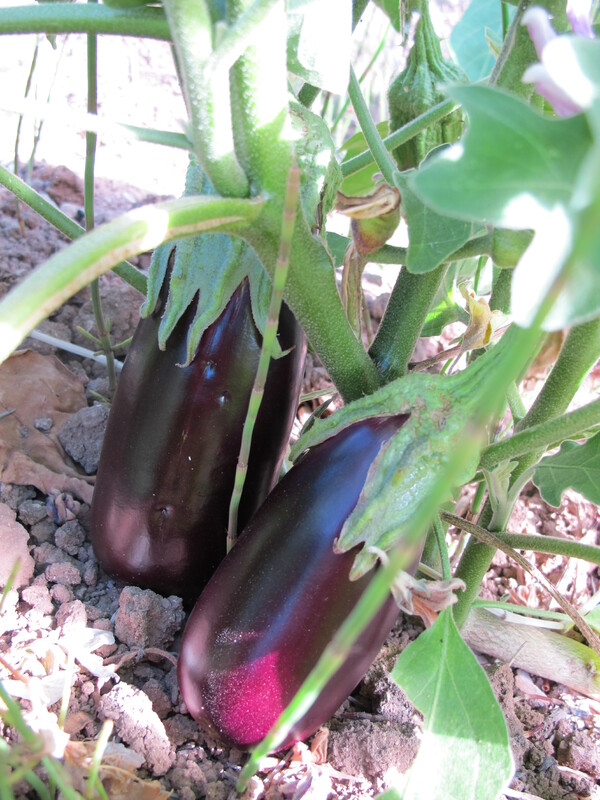 This entry was posted in Garden and tagged Andalucia, CBBH Photo Challenge, fruit, photography, Sandra Danby, Spain on October 2, 2013 by sandradan1.